March 7, 2013 by Meg G.
When I suggested that we make parsnip soup for Simple Supper this week, Heather seemed convinced that I don’t actually like parsnips. Apparently I’ve “refused to let her buy them” in the past. I have no recollection of this and naturally, I saw this as a challenge. Oh you think I don’t like parsnips?! I’ll show you how much I like parsnips! I’ll make a whole soup out of them! In fact, I’ll even make CROUTONS out of them! Take that! The parsnip, if you’re unfamiliar, is basically a paler, sweeter carrot. Parsnips are common here in New England, where the ground gets nice and cold. The freezing temperatures help to sweeten these little guys. (One point for New England’s frigid winters!) 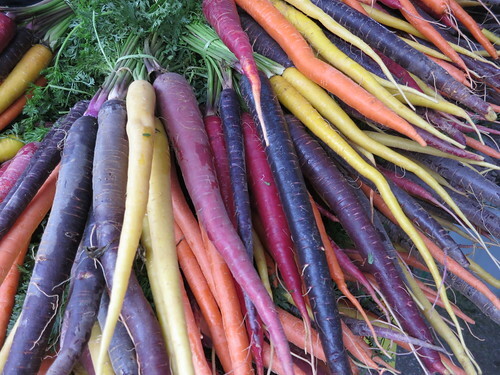 When we went shopping at our local natural food store, I was drawn to some pretty colored carrots and a large daikon radish, so we picked those up, too. Deborah Madison’s Vegetarian Cooking for Everyone is full of hidden surprises, like this parsnip soup and a simple and delicious “quick stock” recipe. I’ve taken to making my own stock of late, but this approach is so much easier and makes a stock that plays on all the flavors of whatever soup you’re making. As Deborah says, it’s an improvisational and relaxed activity – so just go ahead and dive in! Of course you can also use whatever stock you have on hand, but a flavorful stock will make a good soup great. Here goes! Heat a few teaspoons of olive oil in a large pot on high heat and add the onion, carrot, and celery. While they’re browning, peel the vegetables and add the trimmings to the pot, along with the herbs, bay leaves, and garlic. Stir occasionally. After about 10 minutes, add 2 teaspoons salt and 2 quarts of cold water and bring to a boil, then lower the heat and simmer, uncovered, for 25 to 35 minutes. Strain as soon as stock is finished. While the stock is simmering, you can get the soup going. Reserve some parsnip dices for the croutons and some julienned carrots for garnish. Heat two tablespoons of olive oil in a large soup pot over medium heat. Add the remaining vegetables, ginger, and coriander. Cook, stirring frequently, until the onion and carrots have begun to brown a bit. Add the rice and 1 1/2 teaspoons of salt and cook for a few minutes more. Add the strained stock and bring to a boil. Lower the heat and simmer, partially covered, until the vegetables are very soft, about 35 minutes. Meanwhile, prepare the croutons by cooking the reserved parsnips in the remaining tablespoon of olive oil until golden and tender, about 8 minutes. Season with salt and pepper. Remove the ginger (or don’t!) and purée the soup. Serve the soup with a spoonful of parsnip croutons, fresh cilantro, and julienned carrots. HA! I knew I liked parsnips!! I loved the combo of fresh cilantro, crispy carrots, and tender, sweet parsnip croutons. This soup is a great example of multiple things coming together to make a simple meal truly delicious!